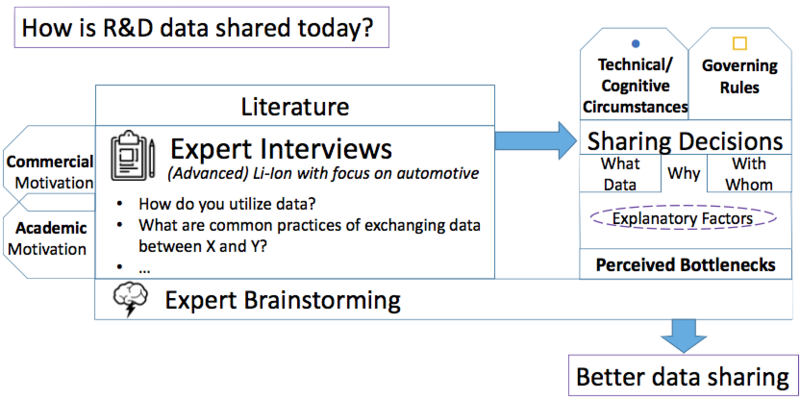 Better data-sharing for battery R&D. Gains in battery performance are hard to achieve. At the same time, computational material discovery, predictive models for state estimation, and cryptographic helpers broaden opportunities to collaborate by exchanging structured data. ​OpenBatt identified how experts deal with exchanging data to advance model-based battery R&D. These insights were contrasted against perceived bottlenecks of available data. As a result, four pathways are suggested that make aggregation of data feasible through multilateral trade where it isn’t today. Read more about digitalization in battery research to see how organizations use data in today's quest for better batteries. View the exposition to see common challenges of joint research. We asked battery experts about their experience and possible solutions for better data-sharing. See the interview guide for more details. The study is conducted by WU Vienna. Manufacturing engineer, speaker on open data and open processes for the industrial IoT. Member of the OMV and WU Energy & Strategy Think Tank and visiting fellow at UC Berkeley and Stanford University.